A fabulous, large, circular ship's kettle. Although we call it a ship's kettle this could have been made for use on a barge. The wide base makes the kettle much more stable when the boat is in rough waters. This example is possibly Dutch and it dates from c.1880. It is very well made, from a very heavy gauge of copper. 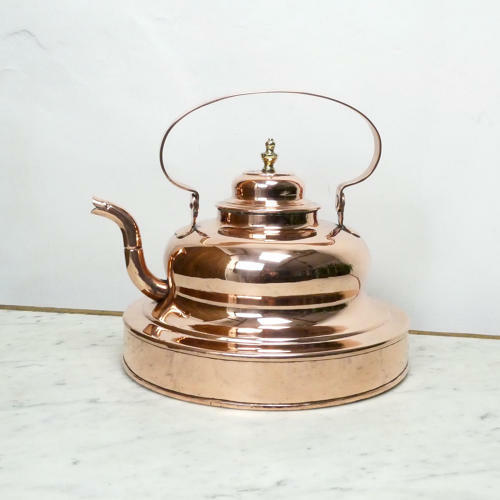 The shape is very attractive and it has a folding copper handle and an acorn shaped brass finial to the lid. This is quite an exceptional piece and it is in excellent condition. The tinning, to the interior, is still good enough for the kettle to be used. The sizes given are the overall dimensions when the handle of the kettle is upright. Price includes postage within the U.K. and Western Europe. Shipping to the U.S.A. add £35.